Its newsroom covers a broad range of issues deeply relevant to contemporary journalists, and is a trusted resource for media professionals everywhere. But Poynter’s work doesn’t stop there. Above all, Poynter is a journalism training institute. It provides top-tier journalism training with week-long seminars, in-person workshops, public events and hundreds of online courses. Recognized worldwide as a leader in media training, the school teaches leadership, ethical decision-making, narrative storytelling and fact-checking to strengthen writing, editing, reporting and digital media skills for today’s journalists. 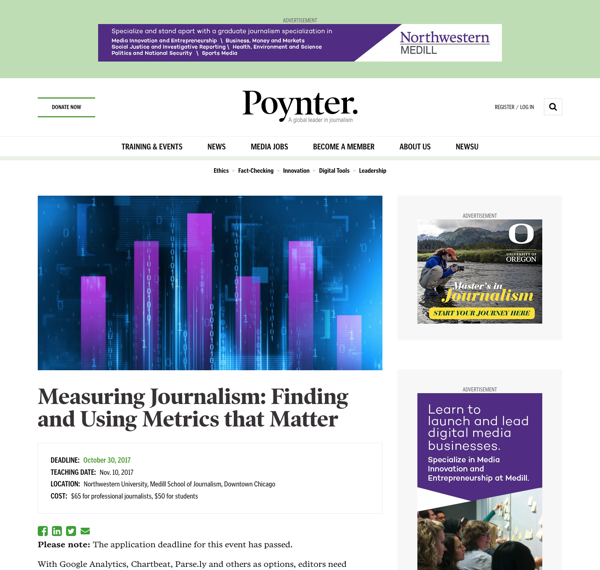 Aten worked with Poynter to architect a digital platform that connects numerous products, beginning with a complete rebuild of their primary website on Drupal 8. Our teams collaborated to integrate content and functionality from multiple legacy properties spanning various CMSs including Drupal 6 and WordPress. To call Poynter’s digital product offering broad is an understatement. It includes an online training platform with hundreds of courses, a fast-paced digital newsroom with tens of thousands of articles, an opt-in newsletter service, a syllabus exchange, registration management for in-person seminars, a customer relationship management system, an online donation platform, an ecommerce gift shop, and more. By the beginning of this project, years of development across all of these interconnected digital products had produced complex touchpoints and hard-to-manage systems. Poynter partnered with Aten to help create a strategy for a more maintainable solution and architect a platform that is faster, easier to use and simpler to maintain. Revolving around a core product built on Drupal 8, the new ecosystem would heavily leverage APIs for a connected experience across multiple systems – from Open edX learning management to SalesForce CRM. 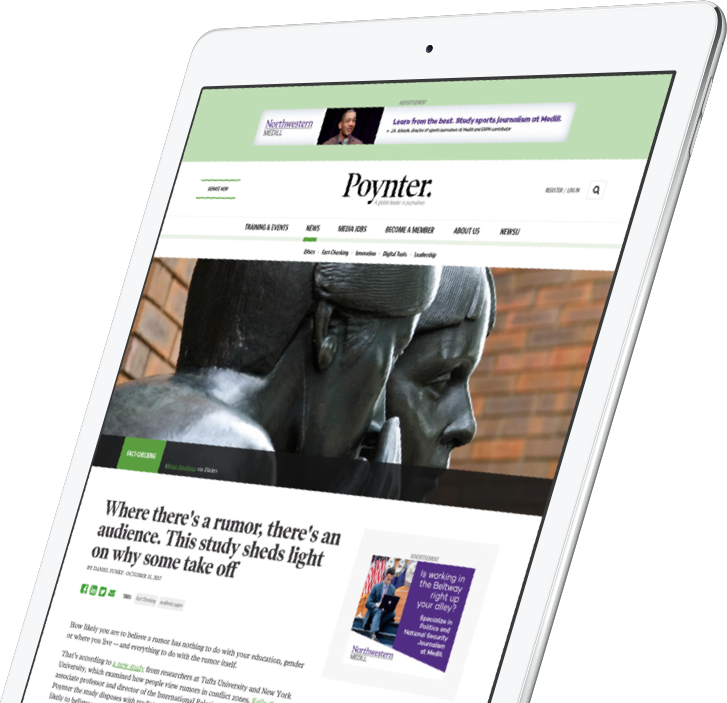 Creating a unified, consistent user experience across all of Poynter’s digital properties was a key goal in the project. We reworked navigation to more clearly capture the breadth of Poynter’s online offering, simplifying down to just five primary sections: training, news, jobs, membership and about. A design audit of their existing systems helped define common elements and laid the foundation for a component library of reusable interface patterns – like article listings, author bylines and calls-to-action. At the surface, the changes were subtle. Collectively, though, they were a strong move toward a more seamless, connected experience. 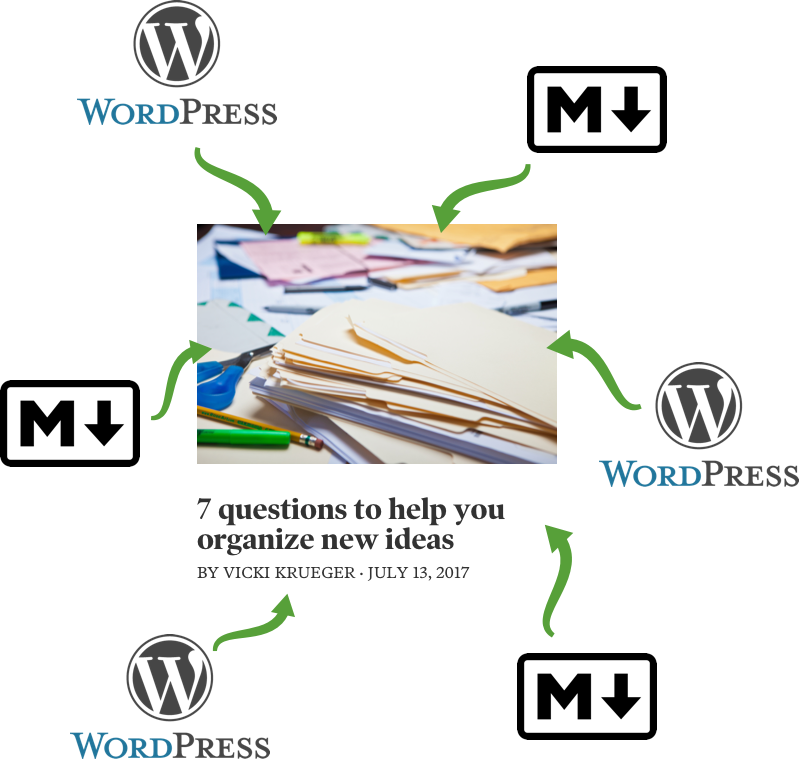 More than 70,000 articles, roughly 1000 authors, thousands of tags, topics, related images and media, from two separate CMSs using two separate authoring styles (Markdown and WordPress WYSIWYG) all needed to be pulled into the new system. We leveraged Drupal 8’s core migration modules with a mix of off-the-shelf and custom plugins to dynamically port all content from the old systems into the new. We added 301 redirects for all migrated content, tested for broken URLs across the entire system and monitored real-time stats for issues during launch. Coming from WordPress, simplicity and ease-of-use were particularly important for Poynter’s newsroom staff. The new authoring experience, built on Drupal 8, combines an intuitive, familiar WYSIWYG with easy-to-use custom features like multiple author credits, manually curated calls-to-action for related training, articles, or events, and category or tag based automated cross-promotion. New articles are set dynamically in a vibrant content ecosystem that carries users effortlessly through multi-page interactions. 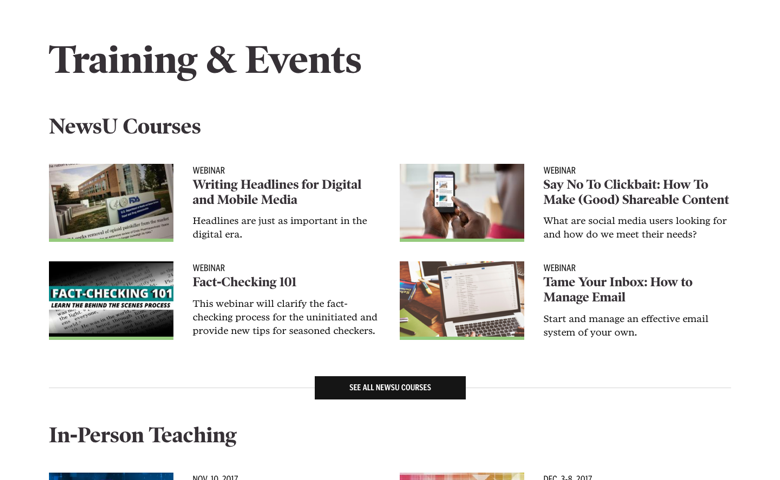 Training opportunities, events and e-learning courses (in some cases synchronized via 3rd party API) are thoughtfully embedded throughout Poynter’s content. 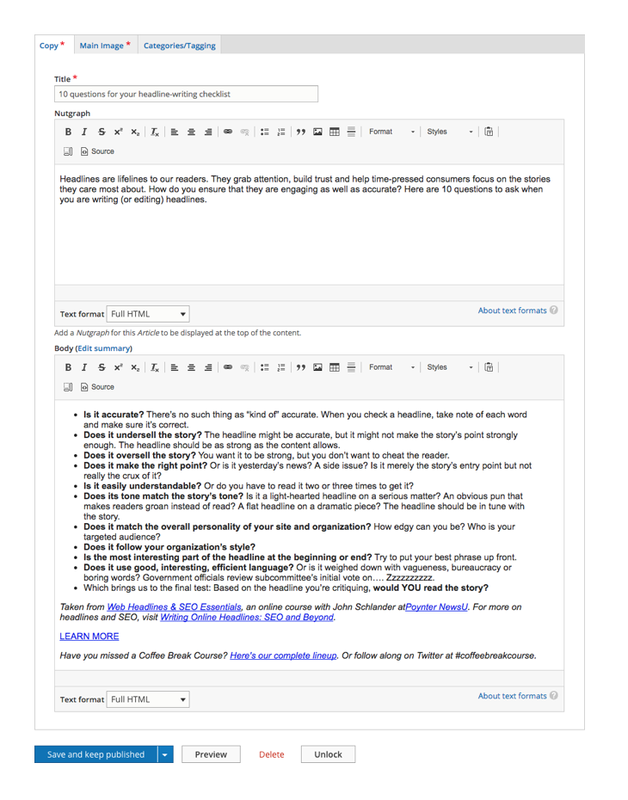 A simple admin interface lets authors promote specific events from an article, and automated fallbacks provide smart defaults. Ads and paid-training promotions are an integral part of Poynter’s business model. With call-outs injected into article content and a robust ecosystem of ad inventories across headers, footers, sidebars and more, you might think that the Poynter.org mobile experience would have a hard time shining. It doesn’t. Intelligent breakpoints, elegant reorganization of content areas and shifting ad spaces mean ads and content play nice on any device. 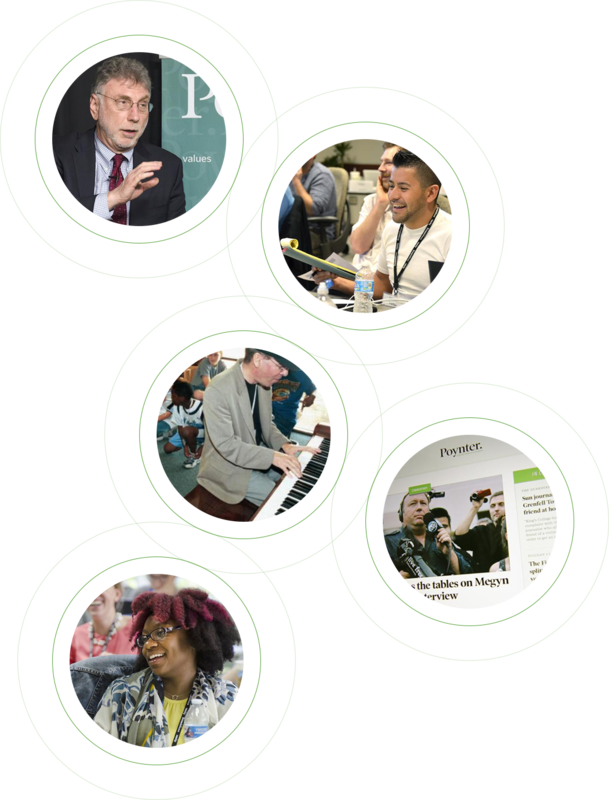 The new Poynter.org is an important foundation for Poynter’s evolving digital ecosystem. We’re excited to see the new publishing platform live, and can’t wait for deeper platform integrations, improved workflows, and other future iterations slated for the weeks and months ahead.